5. 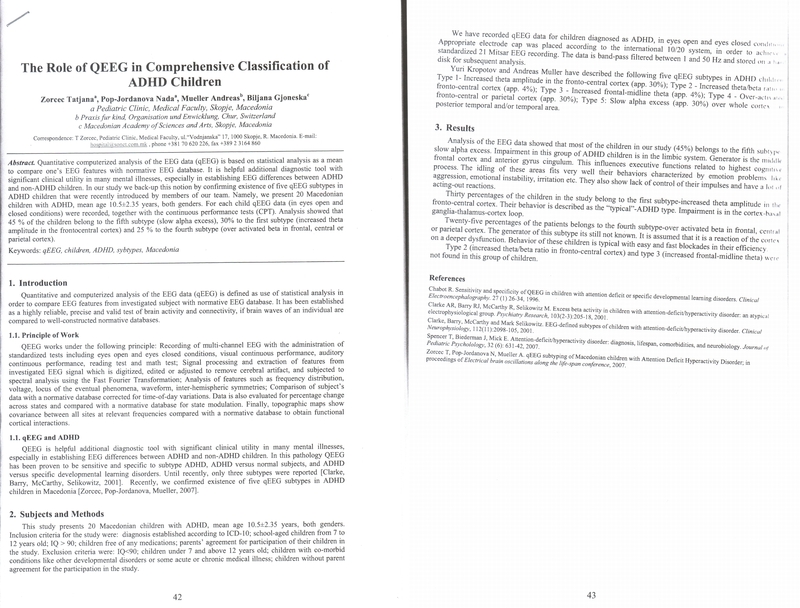 Markovska-Simoska S, Pop-Jordanova N, Gjoneska B, Demerdzieva A. Behavioral parameters for ADHD and normal adults during face recognition and identification of facial emotions. Proceedings from COST B27 Final Meeting. 2009 May 15-16; Zurich, CH. 6. Gjoneska B, Markovska-Simoska S, Zorcec T. Some specific QEEG applications related to neurocognitive dysfunctions. Proceedings from Consciousness and Its Descriptors Workshop in the framework of COST B27. 2009 Mar 27-28; Crotone, IT. 7. Gjoneska B, Pop-Jordanova N, Fustic S. Computer-assisted evaluation and treatment of depression in cystic fibrosis patients. 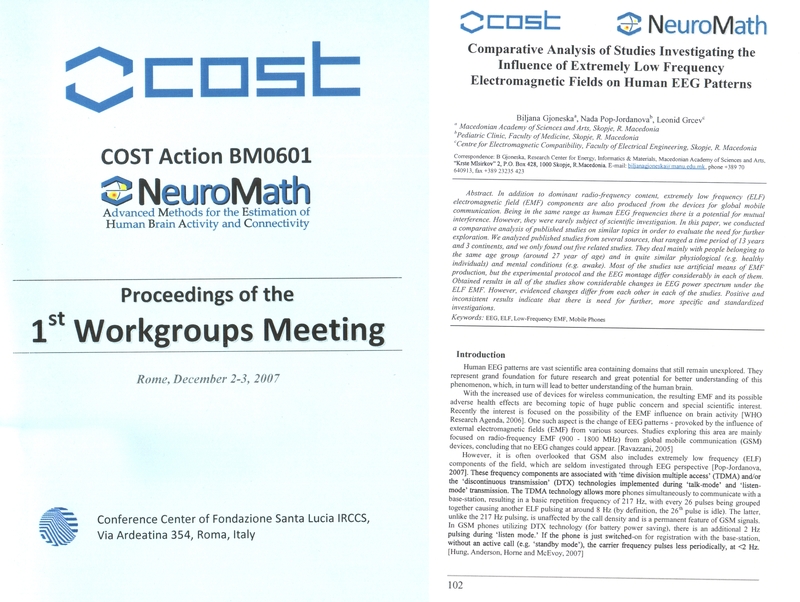 Proceedings of 3rd Neuromath Workshop. 2009 Mar 12-13; Leuven, BE. 9. Markovska-Simoska S, Gjoneska B, Tomovski I, Pop-Jordanov J. Analysis of QEEG spectrum-weighted frequency (brain-rate) for visual and emotional CPT. Revista Espanola De Neuropsicologia. 2008;10:129. 11. Gjoneska B, Pop-Jordanova N, Markovska-Simoska S. Neuroinformatics: Application of QEEG in pediatric research and practice. 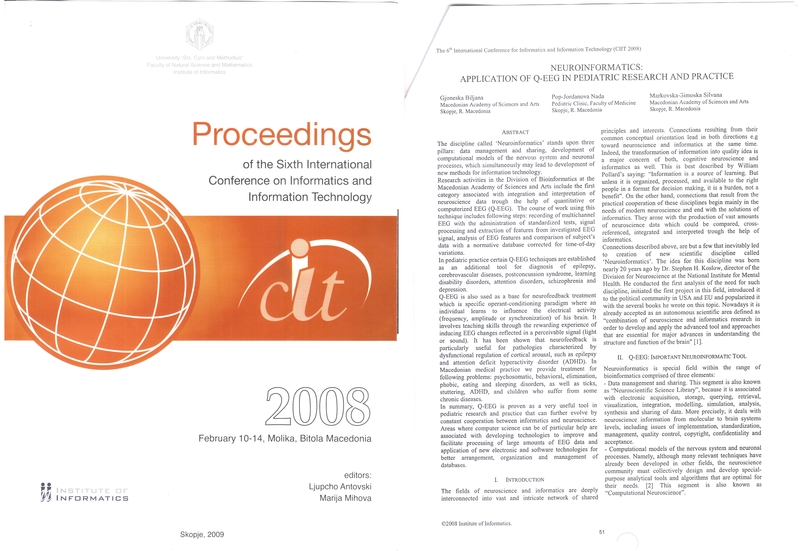 Proceedings of 6th International Conference for Informatics and Information Technologies. 2008 Feb 10-14; Bitola, MK. 12. Gjoneska B, Pop-Jordanova N, Grcev L. Comparative analysis of studies investigating the influence of extremely-low frequency electromagnetic fields on human EEG patterns. 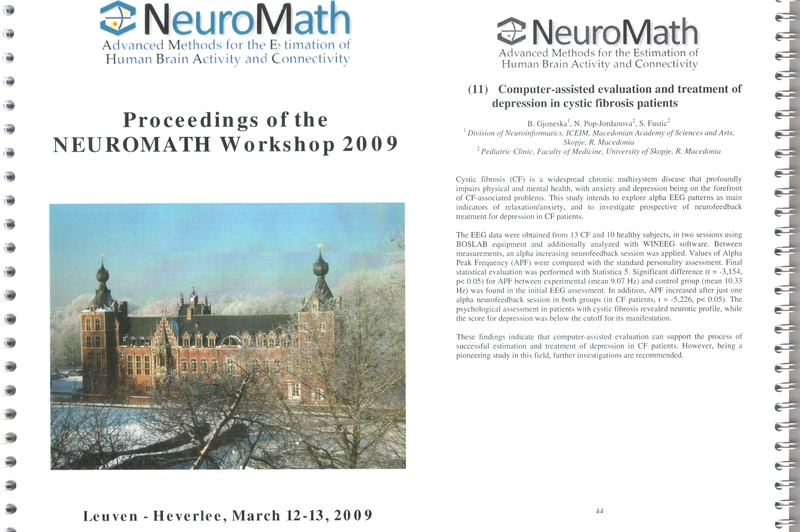 Proceedings of 1st Neuromath Workshop. 2007 Dec 1-6; Rome, IT. 13. Gjoneska B, Georgiev D, Fustic S, Pop-Jordanova N. Characteristics of electroencephalographic alpha rhythm parameters in cystic fibrosis patients: Perspectives of neurofeedback. Clin Neurophysiol. Epub 2008 Mar;119(3):e72. 15. Gjoneska B. Moral and ethical standards of medical students. 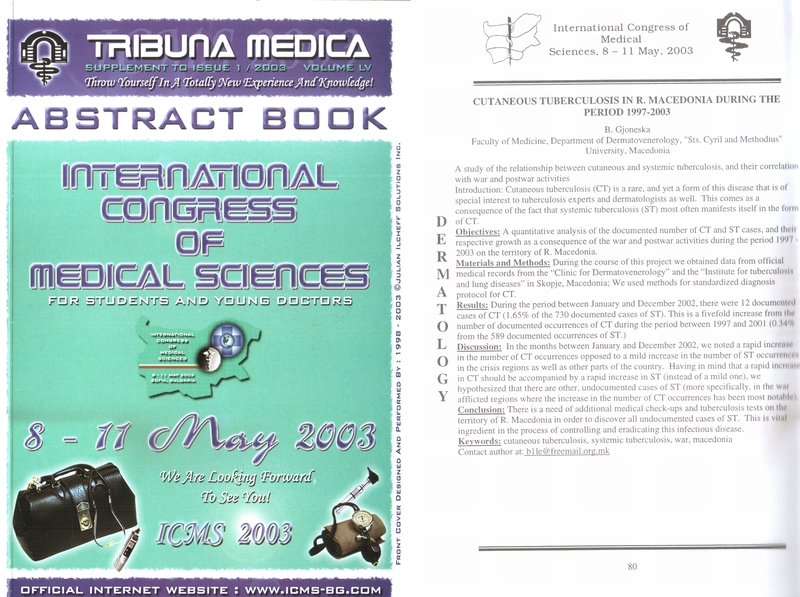 Proceedings of 27th International Medical Students’ Scientific Congress. 2004, May 20-23; Ohrid, MK. 16. 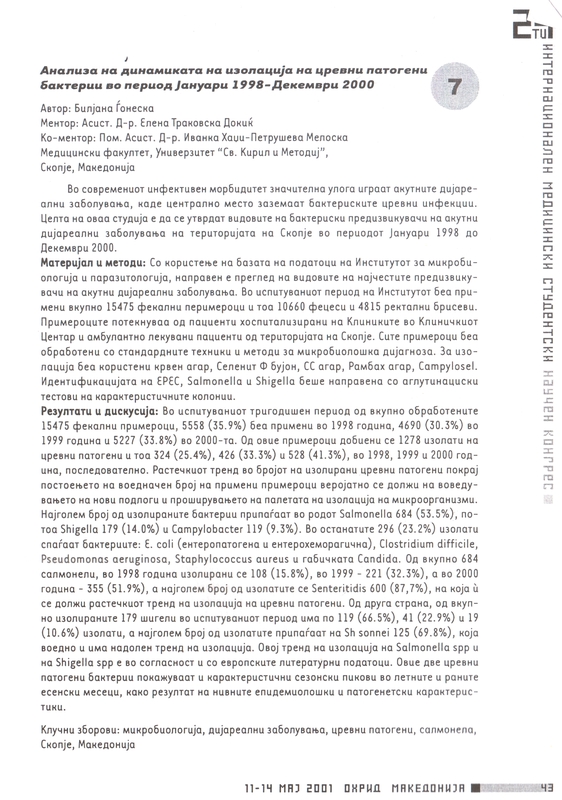 Gjoneska B. Cutaneous tuberculosis in R. Macedonia during the period 1997-2003. Journal of EMSA on Medical and Scientific Affairs. 2004;1:47-49. 17. Gjoneska B. Cutaneous tuberculosis in R. Macedonia during the period 1997-2003: A study of the relationship between cutaneous and systemic tuberculosis and their correlation with war and post-war activities. 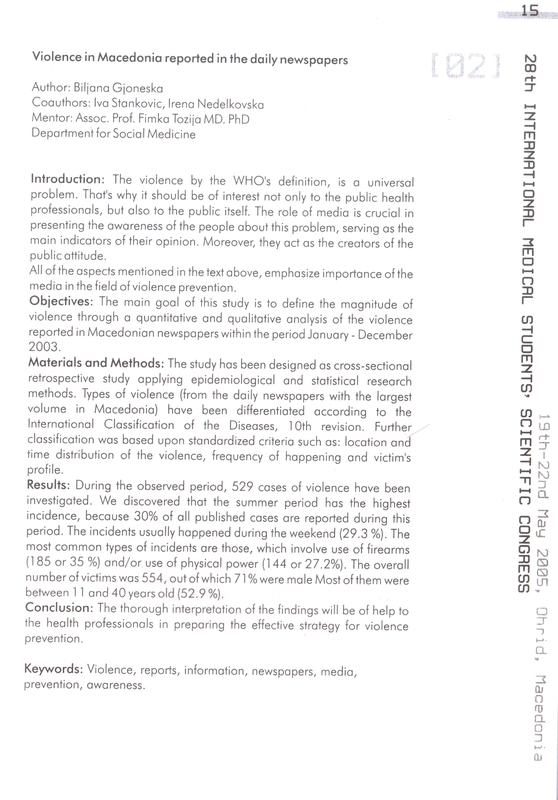 Proceedings of the International Congress of Medical Sciences for Students and Young Doctors. 2003 May 8–11; Sofia, BG. 18. Gjoneska B. Analysis of the dynamics of enteric pathogens isolation in the period January 1998 – December 2000. 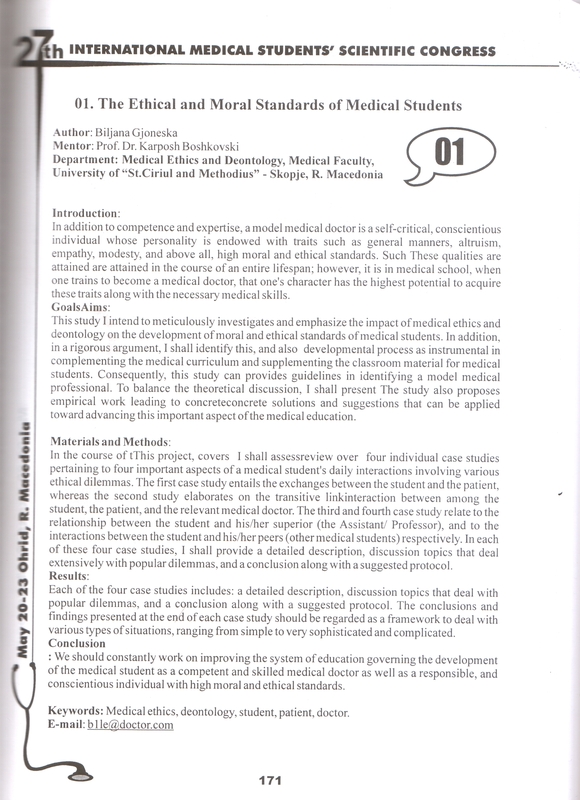 Proceedings of 24th International Medical Students’ Scientific Congress. 2001 May 11-14; Ohrid, MK.